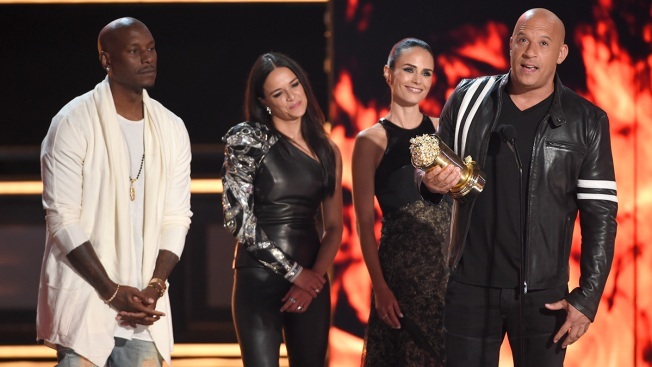 Tyrese Gibson, from left, Michelle Rodriguez, Jordana Brewster, and Vin Diesel accept the Generation award for "The Fast and the Furious" at the MTV Movie and TV Awards at the Shrine Auditorium on Sunday, May 7, 2017, in Los Angeles. The "Fast and the Furious" team is putting the brakes on the ninth installment in the franchise. Universal Pictures said Wednesday that the film's release will move back a year to April 10, 2020. It was originally set for release in April 2019. The studio did not offer a reason for the shift. The latest film in the action series, "The Fate of the Furious," came out earlier this year and went on to gross around $1.2 billion worldwide. The franchise has earned more than $5 billion worldwide to date.